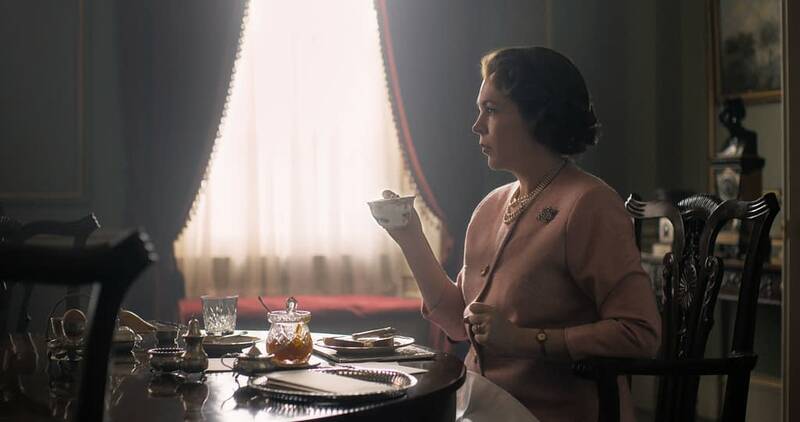 Netflix has released the first image featuring Olivia Coleman as HRM Queen Elizabeth II from season 3 of their drama series The Crown. Coleman is taking over as Her Majesty from Claire Foy, as there will be a changing of the guards (cast) in order to further the timeline of the story. Reportedly season 3 begins in 1963 and will cover events such as the rise of The Beatles and England winning the soccer World Cup in 1966. It’s a safe bet that we’ll be seeing Camilla Parker Bowles at some point this season, as we’ll be getting the beginning of the Prince Charles and Diana Spencer relationship. We already know that Outlander‘s Tobias Menzies is taking over the role of Prince Philip from Matt Smith, Helena Bonham Carter is taking over as Princess Margaret from Vanessa Kirby, and Ben Daniels is taking over as Antony Armstrong-Jones from Matthew Goode. Jason Watkins will play Prime Minister Harold Wilson. No word yet on who will be playing Charles and Diana, or Camilla. Season 3 of The Crown is filming currently and will flow back-to-back with season 4 filming. No release date is known yet, but we’ll let you know as soon as it’s announced. How About 'The Crown', But Reimagined as a Cop Show?